great article, thank you. Now, how difficult is it to lay your own 21mm track. Are there gauges available etc…? Thanks for comments. The Scalefour Society used to have gauges available, but they don’t seem to be listed now. I have a set of gauges by Joe Brook-Smith, which I got from the sociey. Laying track is no more difficult than for standard gauge with these gauges, which include a triangular gauge for gauge widening for curves. 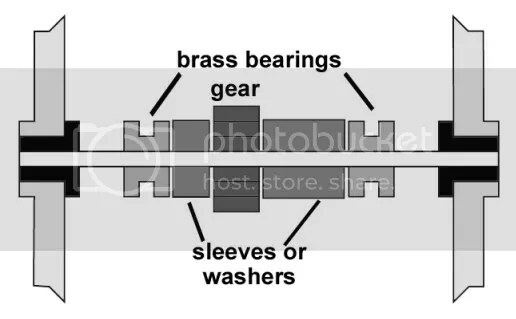 what is the purpose in applying the brass sleeves? I have done the coversion with everything except the sleeves and I am getting a little bit of inconsistant movement along the track….could this be my problem because the wheels are not held laterally in place and could be grabbing the rails from time to time?